County Board/Commissioner: Aitkin County, Minnesota (County Agricultural Society); 19?? to 19?? School Board/Administration: Aitkin, Minnesota (School Board, Member); 19?? to 19?? Military: United States Air Force (Korean War); 195? to 19?? Special Legislative Concerns: agriculture, natural resources, education, governmental operations. He was a member of First Lutheran Church. 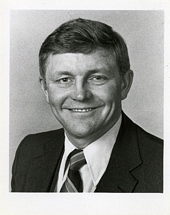 Session Notes: He won a special election following the resignation of Senator Win Borden. He was sworn in on December 29, 1978.